Our first brew, the Eggnog Stout on Govs’ home brew rig. 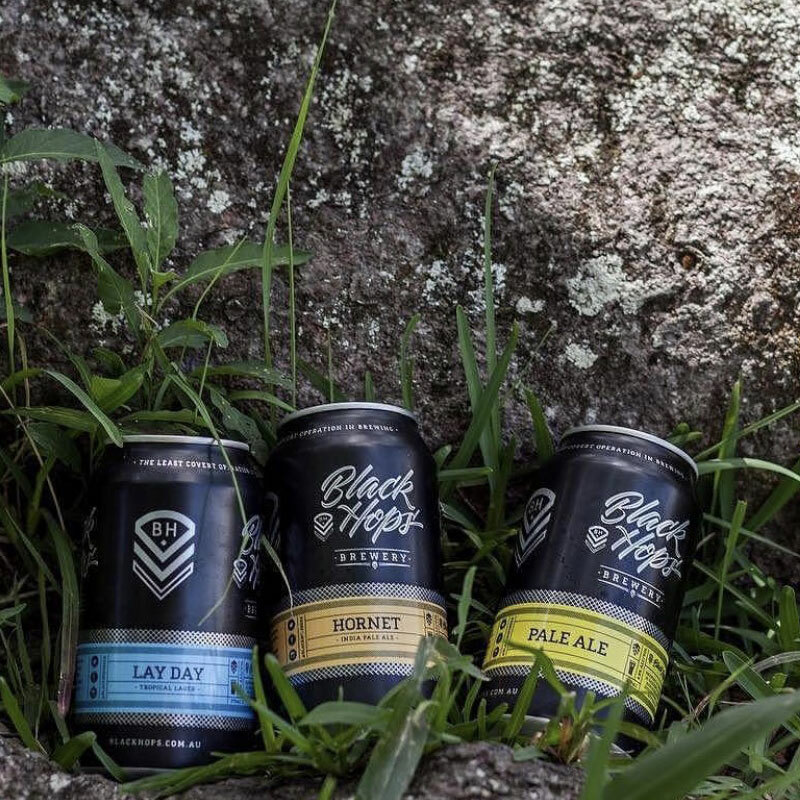 Black Hops Brewing is the story of 3 mates on the Gold Coast making craft beer and sharing everything they learn along the way. In July 2014 Dan Norris, Eddie Oldfield and Michael ‘Govs’ McGovern sat around at a pub in Mt Tamborine talking about beer. The conversation led to brewing and Eddie mentioned he had an idea for a beer, called the Eggnog Stout. He had recently entered a competition by a well known craft brewery, 4 Pines, to suggest a flavour for their next limited release. He didn’t win with the idea, but they did say they liked it so they sent him a carton of their stout in stocky little 600ml bottles. Govs had been a professional brewer for years and as luck would have it, had just set up his own pilot system at home, made up of a bunch of old kegs. He was eager to brew some more experimental brews, so the following weekend the boys headed back up the mountain to brew Eddie’s beer idea, an Eggnog Stout. In the weeks the beer was fermenting, the boys got carried away and started coming up with ideas for a brand, other beers and even designed some bottles and set up an Instagram account. After thousands of options were tossed back and forth, one name in particular stood out – Black Hops. When the beer was ready, they hand bottled it into Black Hops branded bottles and headed to Eddie’s place for their first tasting session. Some of these bottles included the stocky 600ml bottles that Eddie won from 4 Pines a few months earlier. The beer smelled and tasted amazing, just as Eddie had described it in that initial conversation; subtle notes of nutmeg cinnamon, vanilla and brandy but generally just a solid dry Irish stout. It was exactly as they hoped it would turn out. 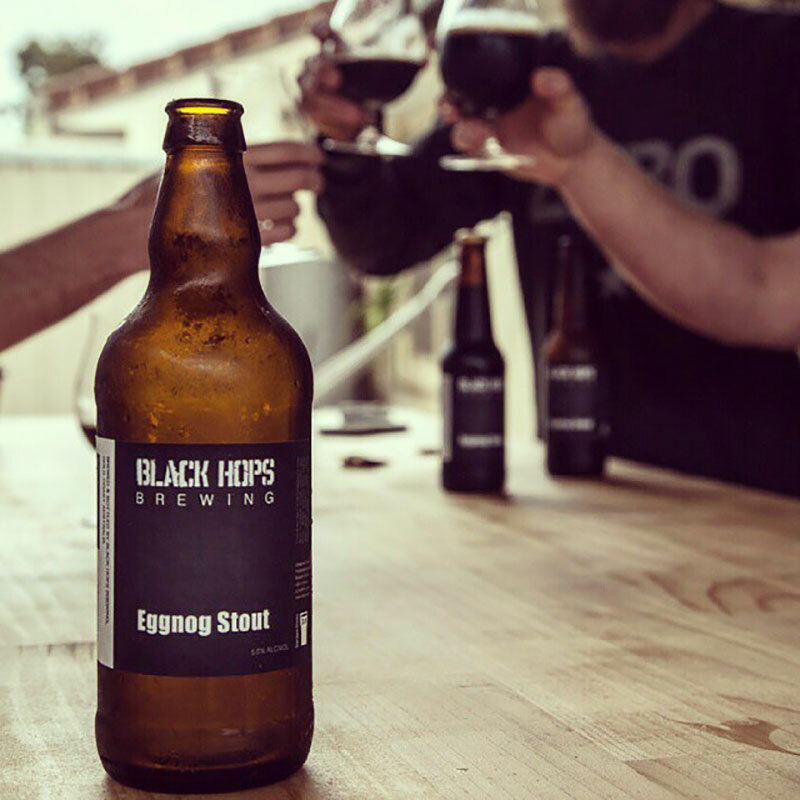 And it felt a lot more legitimate to be pouring it from a fully branded Black Hops Eggnog Stout bottle! The boys each had a few bottles from the batch and some got handed to mates, but importantly a few were distributed to people in the industry – mainly contacts Eddie had established from hanging around in craft beer bars in Brisbane. One such legend was a local beer blogger at the time, Darren, who had a prominent beer blog called ‘250 Beers’ and whose opinion was respected when it came to quality beer. Our first ever beer review. A review by Darren from 250 Beers for our original Eggnog Stout. First commercial brew. 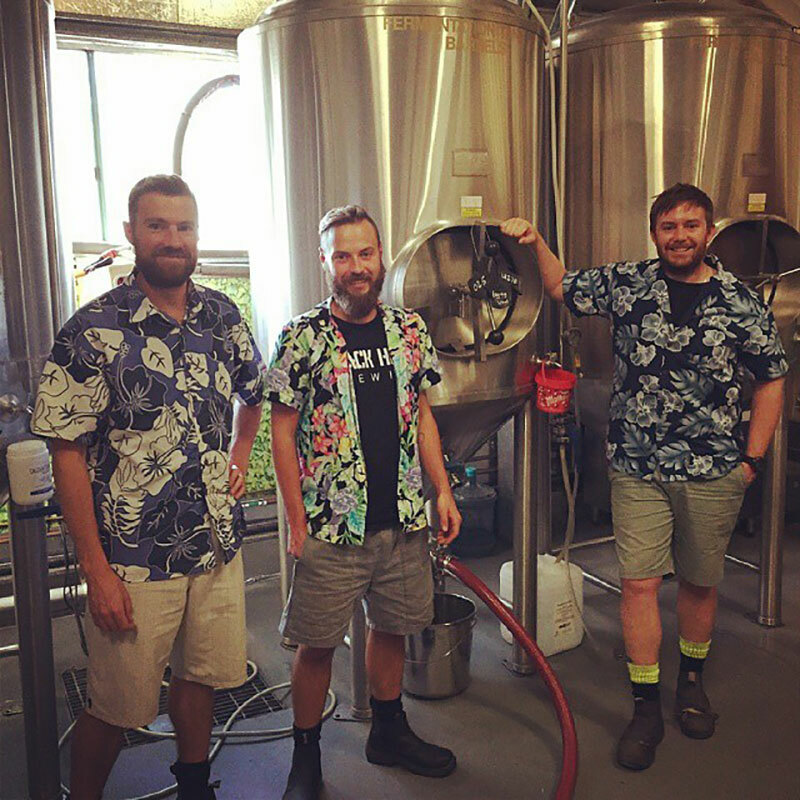 Hawaiian shirts were a mandatory brewery requirement. It was clear that the world needed more Eggnog Stout, so the motions were put in place to make it happen. The step up from home brewing to commercial brewing involved covering off factors such as; licensing, where the beer would be brewed and scaling the recipe up to a larger size. With momentum building it was a nerve wracking but exciting moment in time, as the boys put in $1,000 each to cover off the brew and some marketing expenses. And thus a business was born. They set off down the road of gypsy brewing, making Eggnog Stout at a brewery in Mount Tamborine called Beard & Brau. 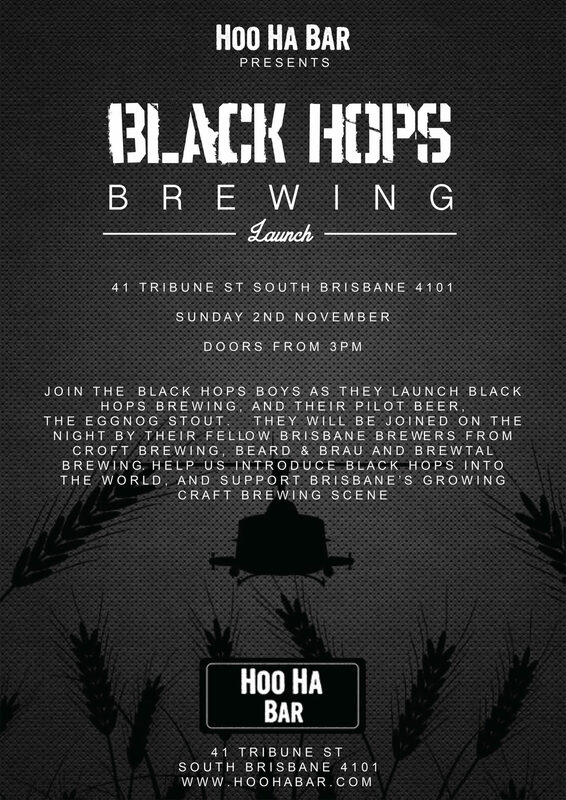 Once they’d brewed enough to keep a gathering lubricated, they organised an official launch party on 2 November at Hoo Ha Bar in South Brisbane. Hoo Ha was a great local bar that Eddie would regularly stop at on his way home on the train from Brisbane to the Gold Coast. Friends and family came and the keg was drained in 2 hours and 20 minutes. People loved the Eggnog Stout! The success of the night was the culmination of a rapid three month rise, from the seeds of an idea to the birth of a commercial brewing company. But this was just the beginning.. 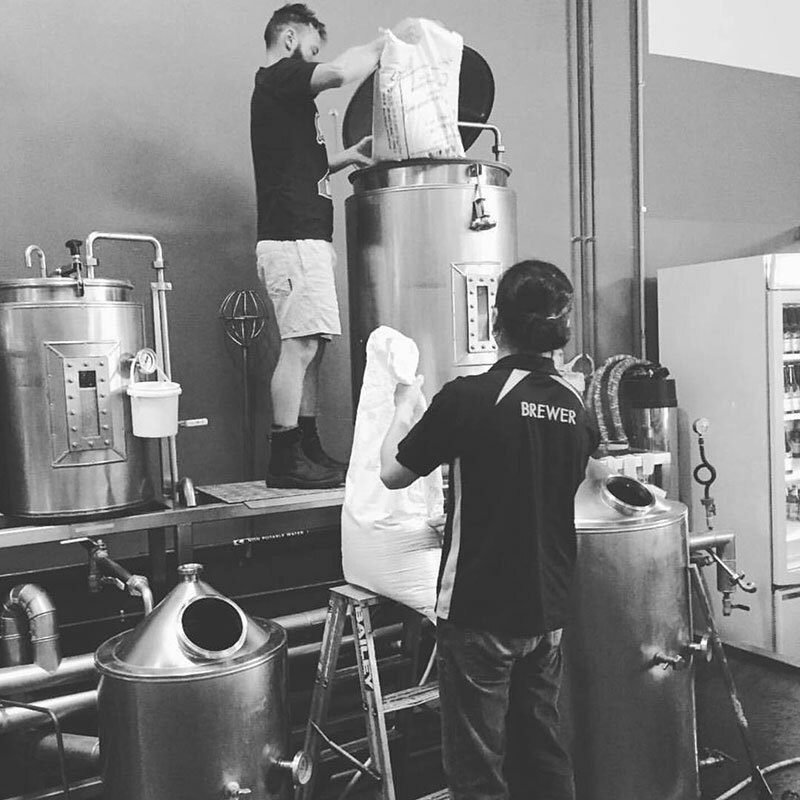 Excited by the success of their first gypsy brewing experience, the boys started brewing small 50-litre batches at Bacchus Brewing in Brisbane, as well as 1,200-litre batches at Four Hearts Brewing in Ipswich. Within a few months they had their Eggnog Stout out in bars. But while the gypsy brewing model was a great fit for starting out and making a name for themselves, it wasn’t going to take Black Hops to the next level. So they took the next big step and transitioned to their current business model, that of their very own brewery! The Operation Brewery Podcast, the first podcast series by a brewery in Australia dug into the ins and outs of building Black Hops. Opening a brewery is an expensive business, so it was time for team Black Hops to bring some outside investors onboard. 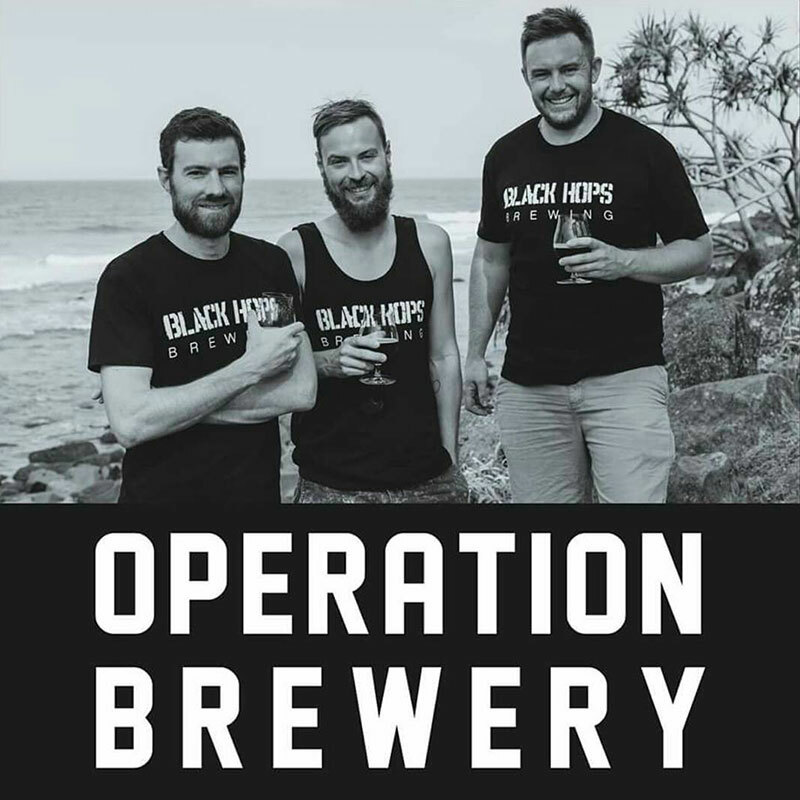 In line with their manifesto of being “the least covert operation in brewing”, the boys recorded a podcast series, the Operation Brewery Podcast, which took listeners behind the scenes as they prepared for the opening of the brewery. They even recorded calls to potential investors and published them, giving a transparent, behind the scenes account of how they went about getting the money together for the brewery. 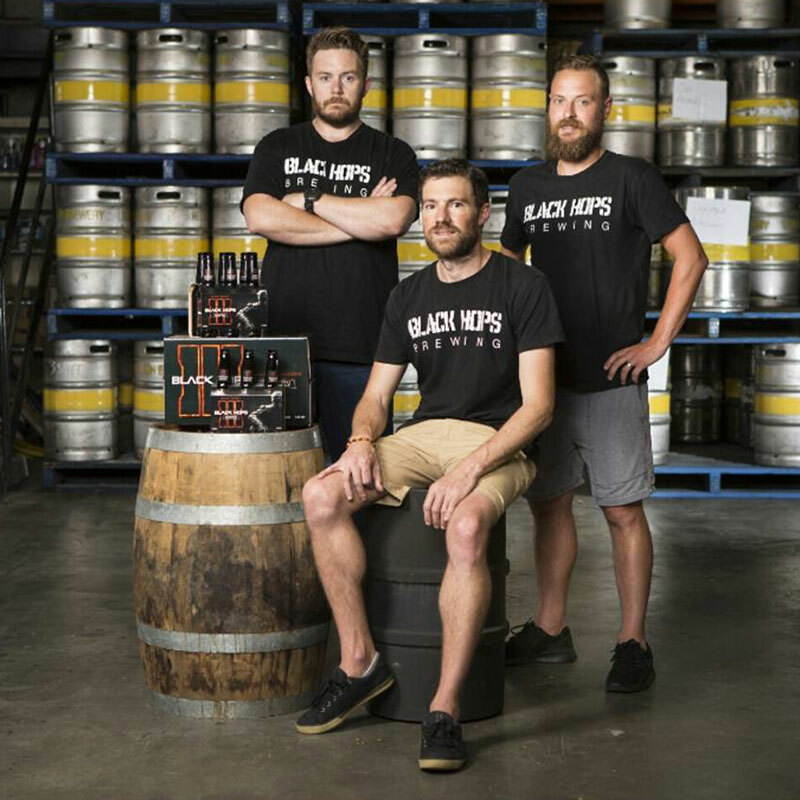 The most valuable learnings were discovering what potential investors wanted to know, and using the knowledge gleaned from unsuccessful meetings to update and improve the pitch on how to ‘sell’ the Black Hops idea. One day in early 2015, Eddie got an email about possibly doing a beer for the release of one of the world’s most popular video games, Call of Duty. Sydney photoshoot for the Call of Duty Black Ops III game launch and associated beer. “When Activision first contacted us we thought it was a hoax and had no idea that would turn into this amazing partnership. We love beer and we love video games, especially Call of Duty, so when the opportunity to create Black Hops III to celebrate the launch of the new game came up, we jumped at it” Govs. 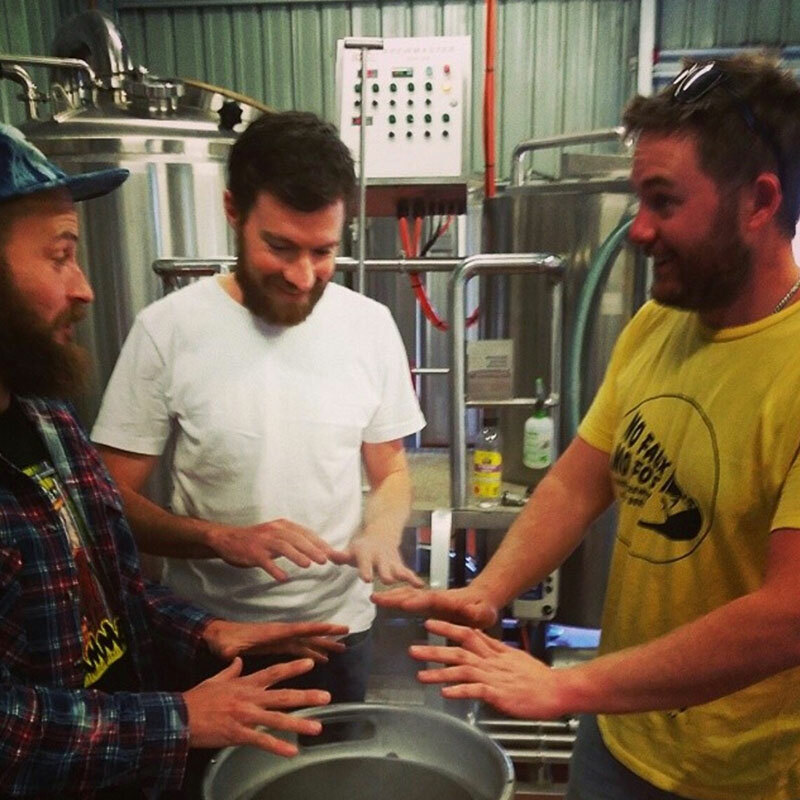 Without a brewery of their own yet, the boys travelled to Sydney to contract brew a midnight Pale Ale. When the game was released, it was accompanied by an official beer launch and attracted a whole lot of local and international press. The video for the world’s first Call of Duty beer, Black Hops III. It was a delicious hoppy, fruity Pale Ale which looked more like a stout and came in black bottles – the idea was that drinkers would get a surprise when the beer was poured into a glass. It was very highly rated and well received and proved one hell of a way to put Black Hops on the map before the doors to the brewery were opened. In January 2016 Black Hops launched their crowdfunding campaign via the Pozible platform, to help fund the brewery build. The campaign was a big hit, with the $10,000 minimum being achieved on the first day and $17,800 ultimately raised. The original Black Hops backers bought cartons of Beach House (a French Farmhouse style Ale) and special limited release ‘OG’ T Shirts. At the time, no other brewery had launched using crowdfunding and as usual the boys shared their experiences via the podcast and the blog, for the benefit of others looking to do the same as they were. Here’s the video from the original crowdfunding campaign. The original crowdfunding video from our Pozible campaign in early 2016. 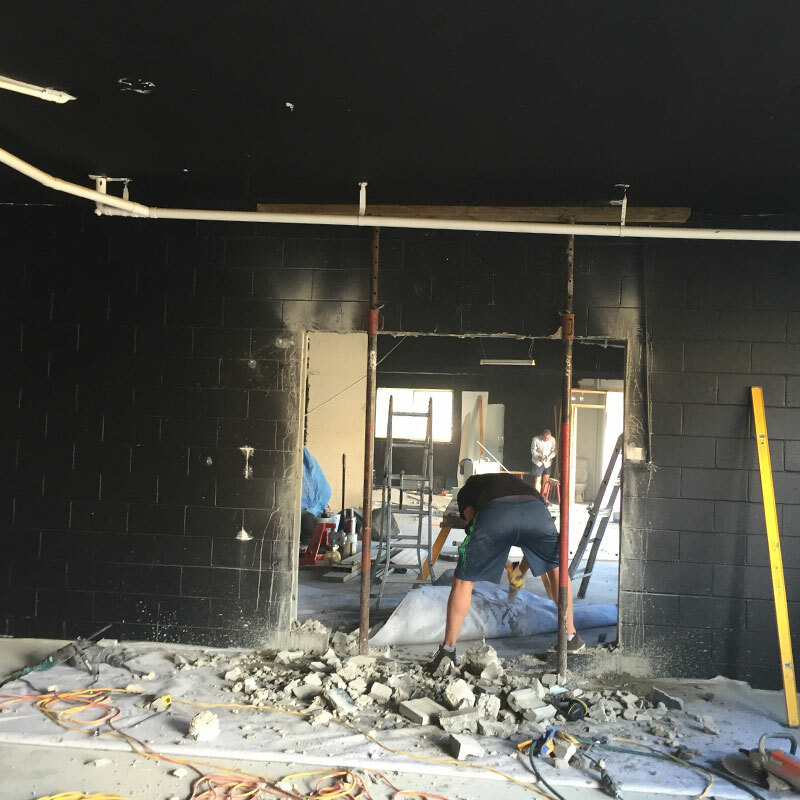 Team Black Hops got busy knocking down walls, polishing concrete and digging up floors. With an impossible budget, they called on family and friends to help and turned 3 old factories into a functioning brewery and rustic Taproom. On 18 June 2016 the doors to the Taproom in Burleigh Heads were thrown open, and the first batch of beer brewed was, of course, Eggnog Stout! This was almost 6 months later than scheduled, But when the final Council approval came through, the doors were flung open the following day. The approved taproom area was 12sqm, but despite the cramped confines, everyone still managed to squeeze in and have a good time. April 2017: hello Pale Ale.. in cans. For the first year or so Black Hops was primarily brewing beers for the taproom, together with a few wholesale kegs. There was a small bottling machine for taproom takeaway stock, but there wasn’t much of a presence in bottle shops yet. This all changed in April 2017, with the arrival of a brand new flagship beer, Pale Ale. This also coincided with the launch of Black Hops in cans, rather than bottles. The beer was announced to much fanfare well before a pilot batch had even been brewed, with the boys then going about creating a Pale Ale to match it’s lofty expectations. Govs nailed the first brew and the recipe hasn’t changed since. 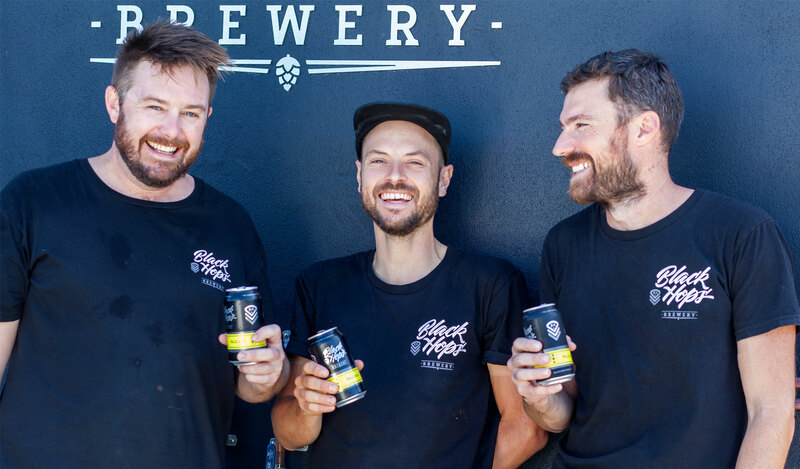 The beer was an instant hit and having the beer in cans and packaged efficiently via a mobile canning provider ensured that Black Hops could produce enough to supply local bottle shops. Working towards a core range of beers, we now had Pale Ale, Lay Day and Hornet in cans. With the original building rapidly becoming too cramped, a lease for the building next door was signed over and in mid 2017 planning began on a Black Hops expansion. Towards the end of the year the original building was refurbished, to facilitate the creation of a larger taproom. At the same time, the newly leased building across the driveway was filled with 4 new 4,000L tanks, an in-house canning machine and an upgraded pilot system. 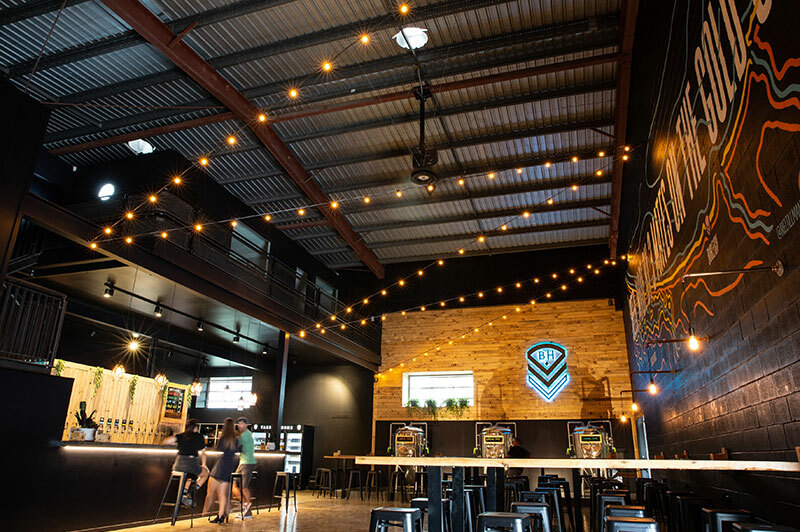 This enabled Black Hops to keep growing the wholesale business and provide a taproom experience to more people in Burleigh. The other benefit was being able to brew lots more experimental brews and work towards an expanded range of core and limited release beers in cans. The GABS Hottest 100 Aussie Craft Beers countdown is the biggest ‘people’s choice’ craft beer poll in the land. 1000’s of beers from all over Australia are entered, so team Black Hops were totally pumped when Hornet came in at a highly respectable #55 on the list. And then officially blown away when Pale Ale came it at #20 for favourite craft beer in Oz for 2017. To put this into perspective, Black Hops achieved the highest position of any brewing company making their debut appearance in the Hottest 100! May 2018: Champion Australian Small Brewery! 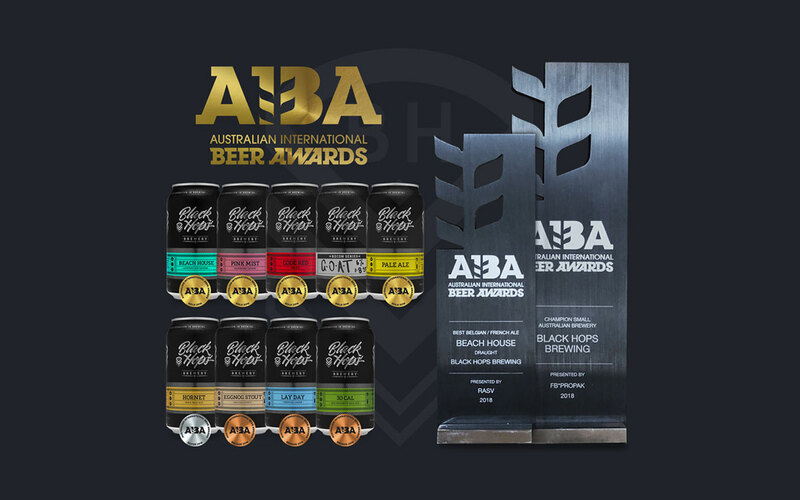 After many years of heading to Melbourne for Good Beer Week, GABS and the AIBA awards, 2018 was the year which confirmed that Black Hops were now major players on the Australian craft beer landscape. Our 2018 AIBA Award Results including Champion Small Brewery. Team Black Hops came back with 5 gold medals including one for the flagship Pale Ale, 2 trophies including Champion Saison for Beach House, and the overall Champion Small Brewery trophy. While doing well at the awards before, including gold and silver results in 2017, this was by far their biggest industry recognition to date. By mid 2018, it was clear the original brewery location could no longer support Black Hops’ ever-rapid growth. The tanks were full and even with the extra factory space across the driveway, the limit on what the brewery could produce at such a small, semi industrial site had well and truly been reached. So focus switched to building a brand new, second brewery. The decision was made to expand to the northern end of the Gold Coast. A suitable location turned up at 671 Pine Ridge Road Biggera Waters, the original Riviera boat building sheds, which were built in the early 1980’s. It was love at first sight for the Black Hops brains trust. 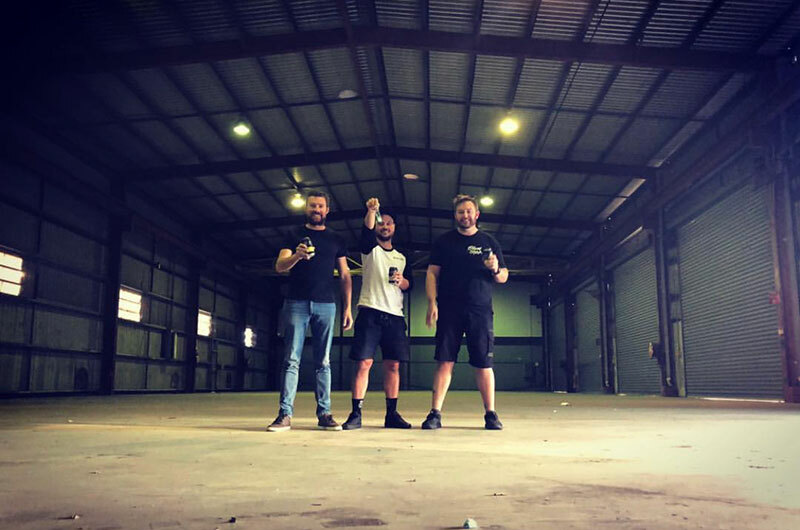 This would become by far the biggest project yet in the Black Hops journey, requiring multiple millions of dollars and taking out a 15 year lease in order to build one of Queensland’s biggest independent breweries. 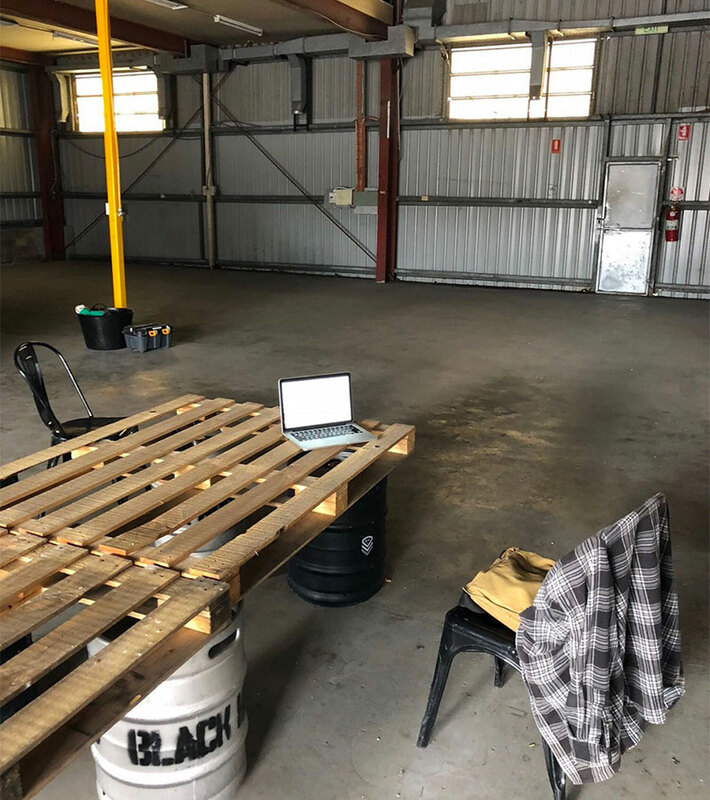 So the lease was signed and work commenced..
After coming in at #55 and #20 in 2018, expectations were high for the 2018 GABS Hottest 100 Craft Beer countdown. This time 3 beers made the final list: Pale Ale, Hornet and Super Hornet. The results were: Super Hornet came in at a respectable #87, Hornet polled a respectable #43 (an improvement from the previous year) and the flagship Pale Ale came in at #14. At this point the beer had not yet made it interstate, other than a small amount to Sydney, so to get close to the top 10 on a national scale was a big result. 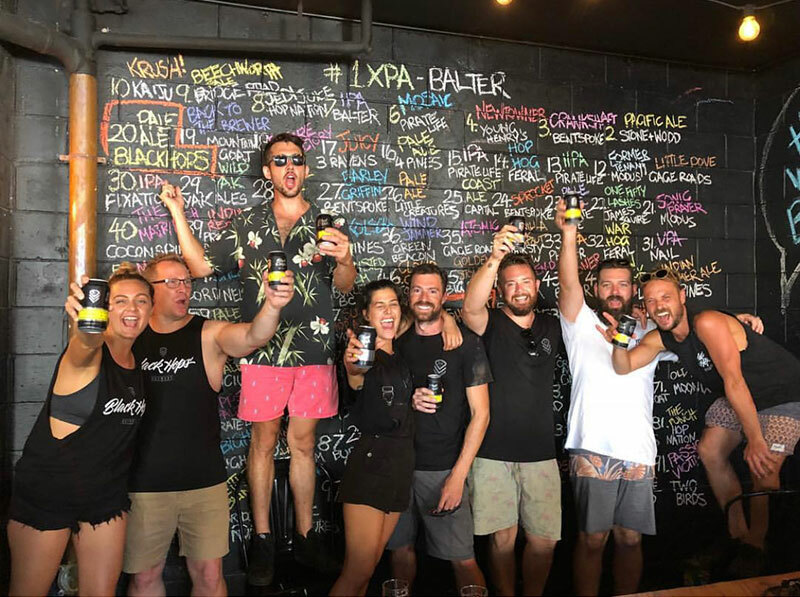 To help fund the new brewery on the northern end of the Gold Coast, the equity crowdfunding revenue raising model, which recently became legal in Australia, was tapped into. The second brewery was well on the way to opening and the funds were much needed to finalise the project. Here’s the video that was put together for the campaign on the Birchal platform. Australia’s first brewery to run a successful equity crowdfunding campaign. The first company in Australia to follow up a rewards based campaign on Pozible with a successful equity campaign on their sister platform Birchal. The fastest campaign ever in Australia to reach their minimum target (8 hours, 15 minutes). The first and only campaign at the time to hit their maximum target ($400k in 6 days). March 2019: Black Hops II opens for business! On Saturday, 2 March, the vision of opening a second brewery became reality as the doors to Black Hops II were thrown open to the public. The project from start to finish took 8 months, significantly less than the time it took to launch the first brewery and features a huge production capacity upgrade, courtesy of a 6,500L brewery with 6, 18,000L tanks. Other features of BHII include a shiny 800L pilot system and an 8 head canning line with upgraded automation capabilities. Here’s some drone footage of the 18,000L tanks going in via the roof. 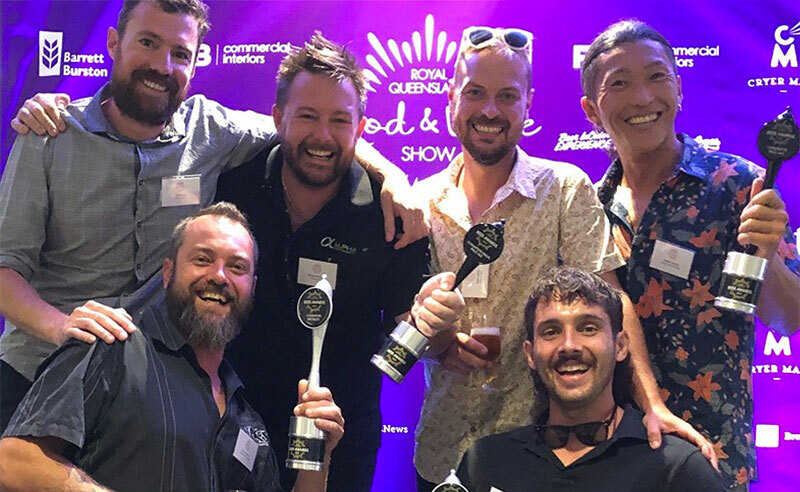 In March the Queensland Beer Awards were resurrected and the founders and brewers headed to the award ceremony in Brisbane for the first time. The team were pumped to come back with a total of 4 awards, including 2 gold medals and 2 ‘grand champion’ trophies. 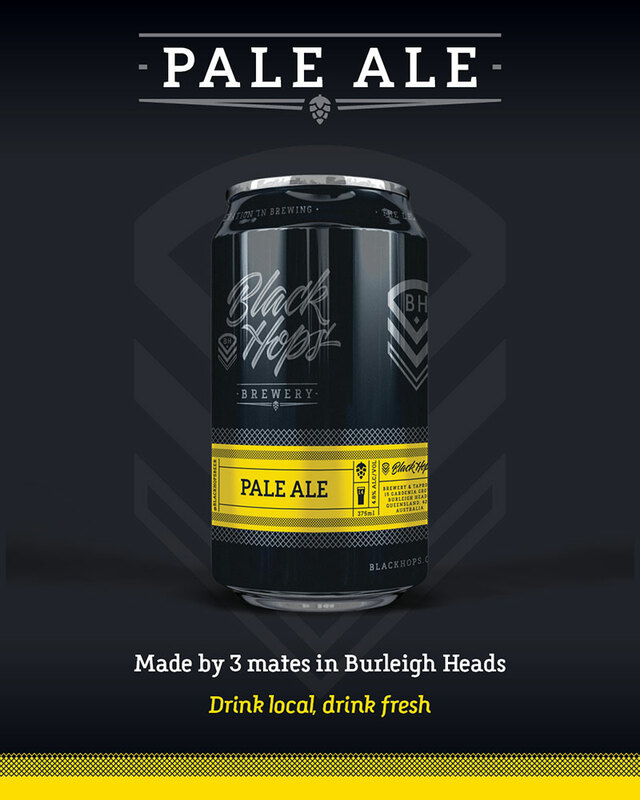 The launch of BH II has provided the mechanism for Black Hops to expand into the NSW, Victorian and South Australian beer markets. In early April 2019 the founders headed interstate on a whirlwind trip, hitting Adelaide, Melbourne, Sydney and Newcastle in 4 days. 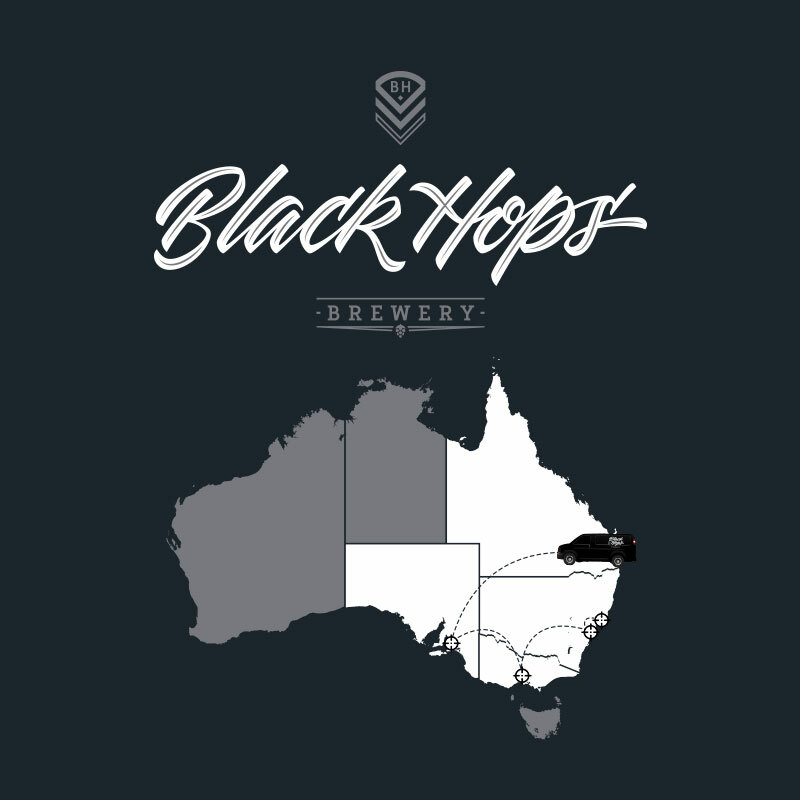 After 4.5 years Black Hops is finally available in venues and retail outlets outside of Queensland and Northern NSW – the rest of 2019 is gonna be big and busy!! From day 1, we’ve shared our story via our blog, podcast, book and social media platforms like Facebook page, Facebook Ambassador Group and Instagram account. We can’t wait to see what the future brings. Thanks for coming along the journey with us. To stay fully up to date, jump on our monthly emails here.